INFYMAX Solutions Pvt. Ltd. | Blog Archive >> » Few Ways To Keep Stress Away From Your Office! Home Blog Few Ways To Keep Stress Away From Your Office! 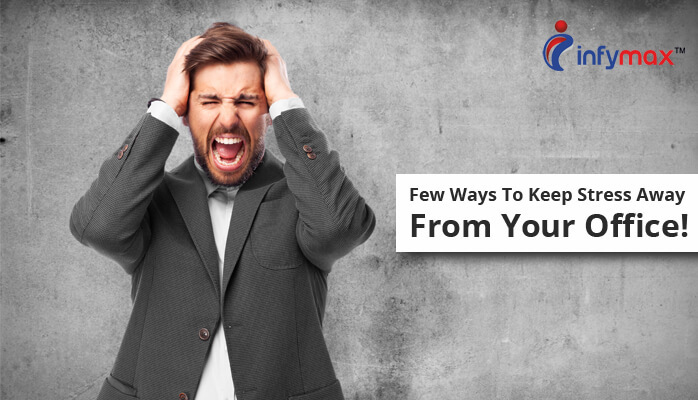 Few Ways To Keep Stress Away From Your Office! Too many missed deadlines? Frequent conflicts at workplace? Maybe it’s time for you to think of some strategies for dealing with stress at workplace. In today’s world, stress is inevitable as there is always a competitive environment irrespective of the industry. But once that stress is unnecessary and becomes chronic it can not only harm your productivity, revenues but can also affect the health of your employees and eventually lead to high staff turnover. Like any relationship communication is the key here! It is obvious that there are too many elements like deadlines, client communications, daily targets which makes it impossible for any employer as well as employees to connect with each other. This is why it is very important to make it a point to interact with each and every employee at least once a month. Picking out individuals and discussing their performance, giving them some actionable advices, guiding and mentoring them and getting them to open up on the daily issues faced by them during the work hours can work like a miracle when it comes to stress management. You can even utilize this time and get employee feedback which will give you an insight into the team dynamics, operational matters, which will eventually reduce stress at work and increase their productivity. Give Them A Better Life! While deciding on the budget you can also set aside some funds for gym discounts and other activities that promote awareness regarding health. This not only tells your employees how much they are appreciated but also encourages a healthy lifestyle and motivates them to do better. Always remember if there is a proper balance of work, life and health, your team will be ready to face any challenge. So next time there is too much pressure at work make sure to take your team out on a brunch or hit the road on the weekends so that next week they can come back to work with a fresh, focused and a motivated mind!